Thank you for your many entries from Mrs Gray’s diary. I tho’t at first to ignore them as I was trying not to immerse myself in still another tale but could not resist. I succumbed to temptation one time too many, I have become thoroughly entranced and now hurry to read them. This overview is a perfect foil for the fun and enlightenment one finds in her diary and I appreciate the introduction. It seems we have a Boston diarist after all. I agree. I sometimes chastise myself for wasting time reading things not related to my own genealogical research projects — but I too am hooked on these diary quotations. What a well-read mind she had, and what beautiful observations were recorded by this very intelligent woman. Thank you for the opportunity to get to know her. I have enjoyed them, too– first, because I am related to Mrs. Gray’s mother-in-law (Mary Clay Gray); second, because it has been interesting to read how the Gray family viewed the Civil War, given they had Southern cousins; and third, because it’s fun to read! Keep the selections coming! My great great grandfather, William Warland Clapp, Jr. and the Clapps before and after must have known the Shober/Grey, etc. extended family. He was an owner and editor of the Boston Journal. His daughter married E. B. Wight who became a nationally-prominent Washington, D. C. correspondent for the Journal, several Chicago and other papers. He was a founder of the Gridiron Club. I have been riveted by all these selections and hope you keep them coming. And what a writer–her description of the ocean, the waves, the beach was truly poetic. Speaking of Mary Boykin Chesnut, as I’m sure you know ‘Diary from Dixie’, which I have read, was sanitized by her friend who did the good deed of saving it from the trash and getting it published after Mrs. Chesnut’s death. It was not until 1981 that the unexpurgated diary was published as ‘Mary Chesnut’s Civil War’, courtesy of one of the premier historians of the American South, C. Vann Woodward. I have also read this full version–memorable. This is one vote for you doing the same for Mrs. Gray. Thanks, Joanne, Linda, Carolyn, Theodore, and Virginia — it’s a tremendous diary, for all the reasons you note! And thank you for your diligent work. I really feel like I am the friend of Hedwiga (what were her parents thinking with that name?!) I wish I could tell her how much I respect her knowledge, caring for her children, and brilliant observations. Thanks, Linda! She was named both for her aunt, Hedwiga Regina Shober (d. 1866), and for a great-grandmother, Hedwiga Regina Schubert. The Shobers had a story that the earlier Hedwiga Regina was a daughter of Frederick William I of Prussia — which seems unlikely! Your description of Mrs Gray’s “backstory” adds another layer of depth to the excerpts from her diary. Though I’m not much interested in Boston society culture, nonetheless I much enjoyed reading her take on the doings of people from close up. I think I might enjoy reading it in book form even more, as I am one who likes to flip back and forth to pick up details that shed light on later events! What a treasure your posts are particularly because she writes wonderful insights and tidbits about my great, great grandmother: Frances Loring Gray Stewart. Her description of W A W Stewart on learning of Frances’ engagement to him is priceless! 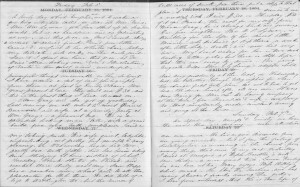 I have spent some years researching and writing about her and her daughter, my grandmother, Frances Violet Stewart Thomas (who you mentioned in a post.) Luckily, my cousin found over 150 letters from FLGS to my grandmother over a 20 year period from 1884 to 1905 in a battered box in my aunt’s attic. She frequently visited, and describes, her parents, William Gray and Sarah (Sallie) Loring Gray (who Regina writes about) before their deaths in 1892. 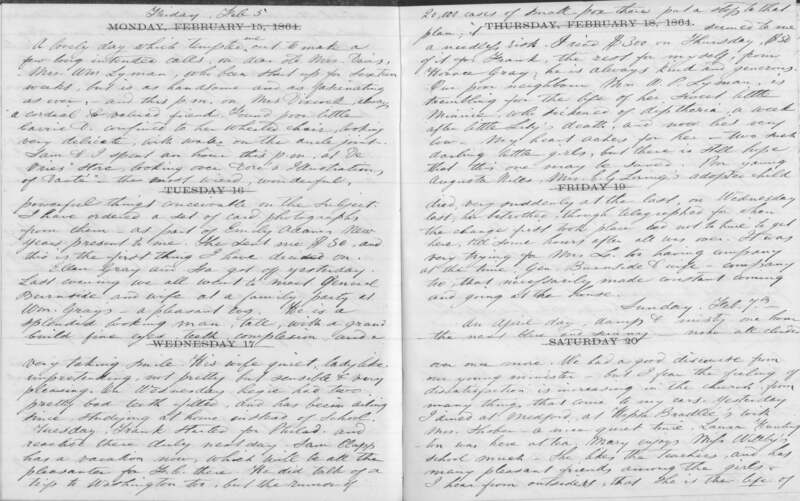 But until I came across your posts of Regina’s diary I had found very few descriptions of my Gray family’s lives during the period before Frances (Fan, Fanny, Francesca) married in 1874. I do have a picture of Morris Gray, Regina’s son, taken in 1877 if you are interested. I too have been looking into the Gray’s feelings about the Civil War since my great, great, great grandmother, Mary Clay Gray, was living with them. Her southern family was in the path of Sherman as Carolyn Clay Swiggert has written about in a wonderful book, “Shades of Gray”. Thank you for the marvelous work you have been doing! I look forward to more. Dear Patricia: Many thanks for your lovely note! Your story about Frank and Regina Gray’s honeymoon makes me laugh: that, in a nutshell, is the Gray tone about which Mrs. Gray writes frequently throughout the diary. (She attributed it to her mother-in-law, Mary Clay Gray.) I have a couple of ties to the Stewarts: my aunt and godmother was Beatrice Anne Curry Steward, daughter of Nancy Stewart Curry Pearce and a great-granddaughter of Frances Loring Gray Stewart; a more distant relation is a Le Roy cousin who married Nancy Pearce’s brother, William Adams Walker Stewart. Yes, by the way, I would love to see your portrait of Morris Gray! Do you have an image I could reproduce? Mrs. Gray probably talks about Morris being photographed, if that was the medium, as she often mentions when she or other family members sat to be photographed. I will take a snapshot of the photo of Morris and hope it comes through well. Just as fascinating is my grandmother, Frances Violet Stewart Thomas (1881-1947) who participated with my grandfather Norman Thomas in everything he did beginning with his work as a minister in Harlem the first 8 years of their marriage (while she bore 5 children all the while with a weak heart! ).They joined the Socialist Party in 1918, he was kicked out as minister of his church in Harlem, and the Stewart and Gray families ostracized them except for her mother, Frances Loring Gray Stewart! Learning about both of them through their letters and more has been my passion. They were both extraordinary women, but for all my life, the Gray and Stewart family stories were off bounds for our generation since they were wealthy capitalists and we were raised very liberal to say the least. Little did anyone know what generous and generally liberal leaders in philanthropy and government in New York City and Boston they were. These values were clearly passed down through most of the Boston Grays and New York City Stewarts to my grandmother who inherited her mother’s strength and easily transitioned into Socialism. My mother knew Nancy Stewart well! Fun knowing of our family connection. Are you in touch with Nancy’s grandchildren — my first cousins — Chip Steward, Thad Steward, and Babbie Chimera? I don’t think I ever met Nancy, although I have a great photo of Nancy and John Pearce with Anne Curry and Charlie Steward at the time of Anne and Charlie’s engagement. No. But my first cousin in New York City, Nancy Stewart Gates Gerber, knows Nancy Stewart Pearce and may know some of her grandchildren. I’ve passed on your question. Scott. Can you give me some email address I can move photo into? Pat, you can reach me at scott.steward@nehgs.org — thanks!